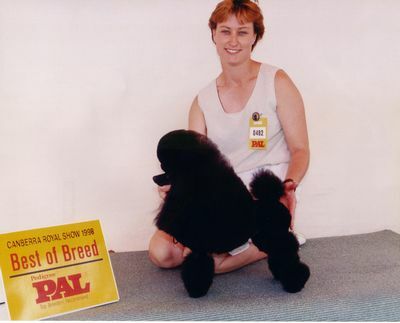 Zippa was my very first show dog. He is stylish, very short in back, has wonderful carriage and attitude to burn. 1998 was his year. He won Challenge Dog and BOB at both the Canberra and Melbourne Royals and Challenge Dog, RUBOB at the April Poodle Club of NSW. During his career he has also won RUBIG, many class in group and class in show awards. Zippa has tested Pattern 'A' Normal/clear for PRCD PRA April 2004.